I have not written a blog post in a long time. I do have things to say and things I want to share, but putting them on paper seems to overwhelm me and I end up getting frustrated. In those moments the delete button is my friend. I have been having some wonderful conversations with my older sister lately and the one we had yesterday resulted in me dusting off my violin and attempting to play a few of my favourite tunes. One thing that my sister and I share, other than DNA, is music. Music has played a large role in both of our lives. I don’t hear it, I feel it. Most of the time I listen to blues but also like everything from the Gregorian Monks chanting to some of the newer rap and chart topping tunes. I love music and there is always a song that speaks to whatever I am going through in my life. When I spoke to my sister this morning, we had recently shared some poetry with each other, she asked if my creativity was a result of emotional pain. She had asked a great question and it got me thinking. When I started this blog I had just gone through the cancer diagnosis and death of the man I loved. There was a lot of anger in me and part of me thought that the universe had taken the wrong person. He had so much that he wanted to do and his art career was just beginning to take off. His life seemed so much more than mine that I thought they should have taken me and I even offered to change places with him. Since that time my life has changed so much that sometimes I don’t even recognize myself. I mean I am still me of course, but there are events in life that have changed me in such a significant way that I don’t remember what life was like before, or what I was like before. Because the universe has such a great sense of humour it constantly puts people in my life that mirror the old me. I know I am rambling a bit and am not even sure what the point of this blog is today other than to get me writing again. Does it really matter what the point is? It all matters and at the same time nothing matters. I guess taking a trip down memory lane with my sister has reminded me of a few things. Once you understand certain truths and gain knowledge you have a responsibility. Knowledge brings power and you get to decide how you are going to use it. Ultimately you are only responsible for your own actions and reactions to others. Sometimes I have noticed that the words that come out of my mouth and what others hear are two different things. The words are filtered through their experiences and fears, and they hear what I say in a way that reaffirms those fears for them. Strange isn’t it? So what do you do in those instances? I try to reword things in a way that allows them to see beyond their fears, but in all honesty I get tired of it quickly. Saying the same thing in twenty different ways looses its appeal quickly. Because I understand a few things that other people may not, I have a responsibility to treat them with kindness and compassion and all I can do is share my experience with them. How they interpret it is not my responsibility. I have learned a lot in the last year. I have constantly been challenged to operate out of my comfort zone. Sometimes I have participated willingly and other times needed to be dragged out of that comfy place. I am forever in debt to the people who were patient enough to help coax me out of that place of comfort with kindness and compassion. If I am constantly in that comfort zone and experiencing life from that perspective I am missing out on some wonderful opportunities and experiences. I never would have met the wonderful man who brings so much joy, laughter and love to my life. There are so many people and experiences I would have missed and let me say that each person and experience has helped shape the person I am becoming. I guess what it all boils down to is that life is short, shorter for some than others, so take a walk outside your comfort zone and see what the world has to offer. The only thing that creates that zone is fear. Find out what those fears are and face them head on. My way of doing this is asking myself what is the worst thing that could happen. Nine times out of ten it is worth the risk. So are you going to hide from life because ten percent of the time things don’t work out so well? Be honest with yourself and others, treat yourself and others with kindness and compassion. Notice that I put you first! It is strange to reconnect with people you haven’t seen in twenty years. They remember who you were, but don’t know who you are now. They are in a sense strangers to me, though we are connected by blood and history. Now we get to make new memories with and of each other. Some of us have kept in touch over the years but there is nothing like hugging them in person and looking into their eyes when we chat. We are all a combination of our experiences and life’s ups and downs. We are shaped by them and they are visible in our physical bodies as well. I got to visit Peggy’s Cove yesterday. It was and still is one of my favourite spots. The lighthouse on that rocky point warning mariners of the dangers along the shore stands tall and strong against the power of the wind and water. The rocks there are amazing and treacherous with huge waves that have swept many unsuspecting people out to sea. Yesterday, it was windy, rainy and cold and we spent more time in the restaurant gazing out the window than we did exploring the rocks. I ordered seafood chowder and a piece of their famous gingerbread with lemon sauce. It tasted as wonderful as I remembered. 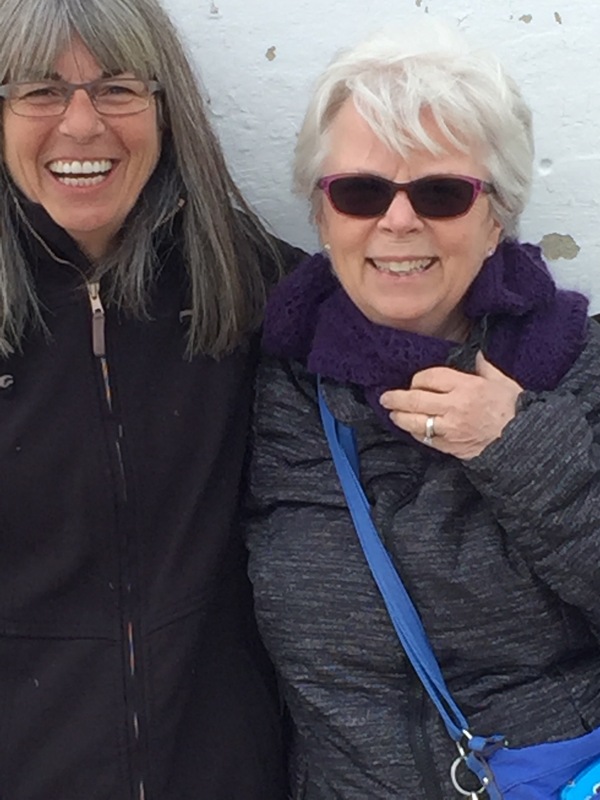 Here is a picture of me and my older sister Marg huddled against the side of the lighthouse. My sister is thirteen years older than I am and she has been more like a second mother to me over the years. I was the flower girl at her wedding and have had the man she married in my life since I was two years old. My brother-in-law, Brad, used to take me out trick or treating and they took me on summer vacations with them. I tease them and tell them I was their practice child. I am blessed to have them in my life. They tease me, annoy me and love me. On this trip I got to meet some of their grandchildren that have all been born or become part of their lives since my last visit in 2009. I do not have any children of my own but I spent many many hours with my niece and nephews when they were young and I miss having children to play and let loose with. This is also my first trip east that did not involve the funeral of a loved one and I am determined to have more fun trips home. I am determined to have more fun! Somewhere along the line I turned into this serious person who did not have time to play. I think I shall spend the next few years reconnecting with the playful side of myself. So if you see a lady with long grey streaked hair and a big smile on her face acting foolish join her! There is still lots of play and laughter left in this tiny body I inhabit. I am spending the day with one of my cousins. We are going to visit a friend’s farm in the valley then out for supper. I was never close to this cousin because of our age difference but when we met again last week there was an instant connection and recognition of souls. He is a big tough looking man with a heart of gold. He could even scare you if you did not know him but he has a wonderful sense of humour and a soft spot for children and animals. So do not judge people based on their appearance. Take me for instance, I look all tiny and fun but get me angry or be mean to someone and I am a force to be reckoned with and will stand up to anyone regardless of size and demeanour. So behind the tattoos, rough clothing or doo-rags there are some beautiful people, don’t miss out! I am often wearing jeans, biker boots and a Rolling Stones t-shirt, have my nose pierced and am getting my first tattoo. Yes I know, I am still not intimidating because of my size but people still judge me based on my clothing choices and appearance. Accept people for who they are, not who you think they should be. It makes life stress free. This trip has been good for my soul. I plan to do more things that are good for my soul! At this point in my life if I cannot have fun doing it, it is not happening. In reality you can make anything fun, it is a choice. I dislike doing housework so I turn on the tunes and sing and dance my way through my chores so even cleaning the bathroom can be fun. So, go out and have some fun today. I know I will. Well it is sunny out there today and I am off to the farm. Have a fun filled day and spread some joy and laughter with the world.